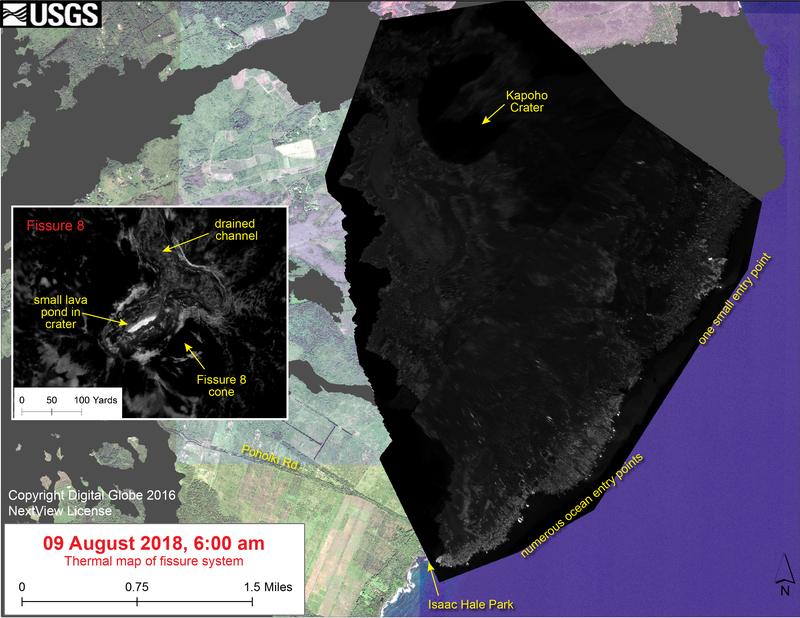 This thermal map shows the fissure system and lava flows as of 6 am on Saturday, August 11. Residual lava in the Fissure 8 flow continues to drain, feeding numerous small ocean entries (shown in main map). In the Fissure 8 cone there were two small lava ponds (shown in small inset map). The black and white area is the extent of the thermal map. Temperature in the thermal image is displayed as gray-scale values, with the brightest pixels indicating the hottest areas. The thermal map was constructed by stitching many overlapping oblique thermal images collected by a handheld thermal camera during a helicopter overflight of the flow field. The base is a copyrighted color satellite image (used with permission) provided by Digital Globe. This is a Civil Defense Message for Monday, August 13, 2018. The Hawaiian Volcano Observatory reports that eruptive activity remains at reduced levels at Kilauea Summit and the lower east rift zone. Seismic activity at the summit is low with few earthquakes. The lava pond in Fissure 8 cone is mostly crusted over. Fissure 8 along with other fissures continue to release gas. Lava was reported oozing at several points along the Kapoho Bay and Ahalanui coastline creating a laze plume. Although a lull in activity continues, it is common for eruptions to go through periods of diminished output, or to pause completely, only to reactivate days or weeks later, or longer. Volcanic activity could occur at any time. Residents should remain informed and heed Hawaii County Civil Defense messages and warnings. Motorists on Highway 11 between the 28 and 32-mile markers are advised to stay on the pavement, be alert for changes in road conditions, and drive with caution. The plates on Highway 130 are stable. Motorists are reminded to slow down while traveling through the area. The Disaster Recovery Center, located at the Pahoa Community Center is open today. 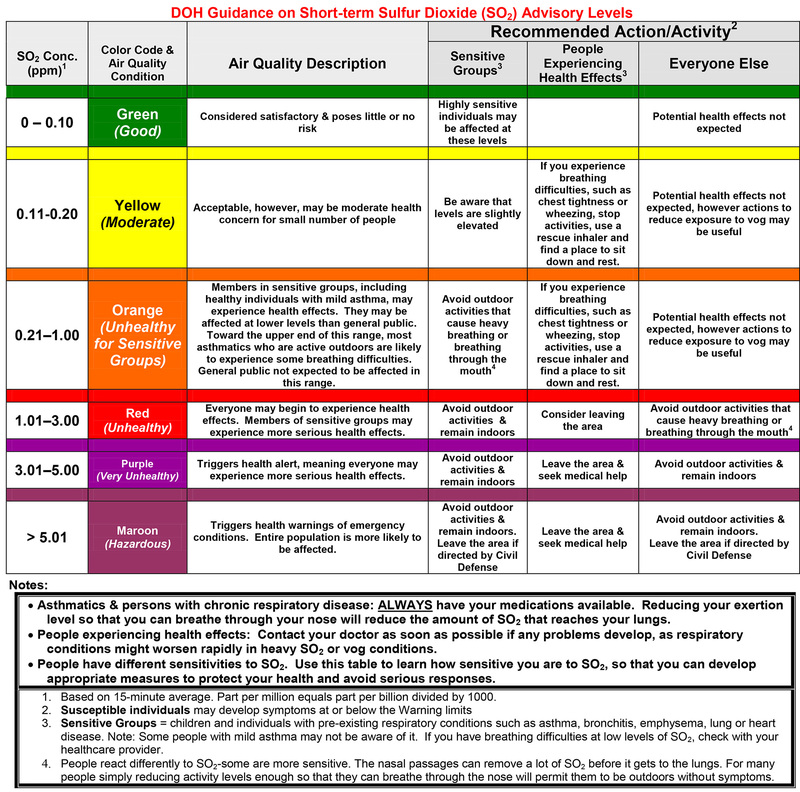 Sulfur Dioxide (SO2) gas from fissures is especially dangerous for elderly, children/babies and people with respiratory problems.